Edgeview® is a new analysis and consulting service that helps the plant process engineer and corporate heat transfer specialist reduce plant downtime, reduce energy costs, plan maintenance activities, and ensure safe operations. Our Edgeview service is supported by a new software component, which will be customized to analyze plant operating data. The analysis is tailored to meet site-specific needs, including thermal models, diagnostic algorithms, and specialized data integration. Based on more than 55 years of HTRI research, Edgeview performance diagnostics help reduce costs, increase production, and improve efficiency. Heat exchanger fouling causes excessive downtime, higher utility costs, and decreased production, making it a top concern for heat transfer engineers. However, accurately determining the fouling resistance in any given exchanger is challenging. Edgeview helps identify operating regimes that reduce fouling in shell-and-tube exchangers. The Edgeview service is built on new HTRI software, compatible with the acclaimed Xchanger Suite®, which provides evaluation and indicators of heat exchanger performance using plant operating data. It supports sensible and phase change conditions for individual shell-and-tube equipment as well as shells-in-series. With multiple performance models and expert analysis algorithms, the Edgeview solution is an important resource for engineers at process facilities. 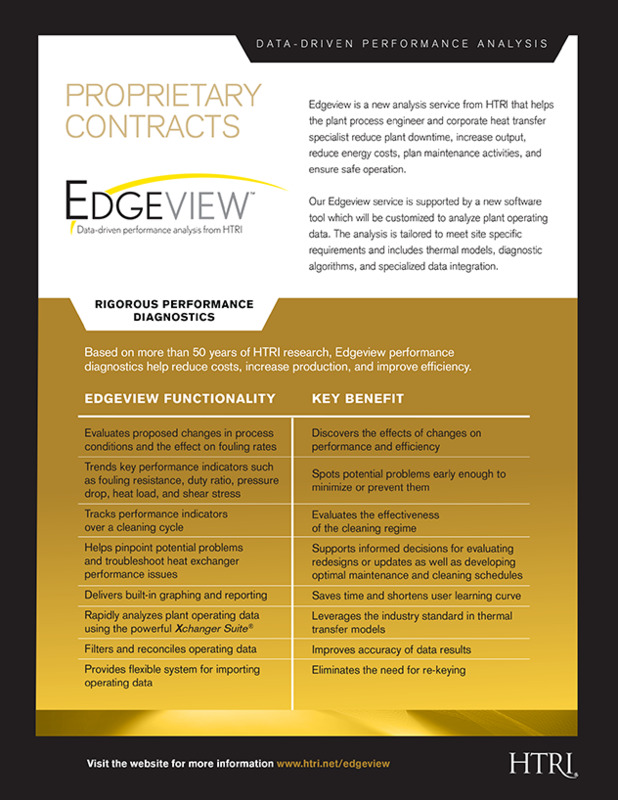 Contact us at edgeview@htri.net to learn how HTRI Proprietary Contracts can help with your next project.